I'm the getting the hang of watching rugby. At Sale Sharks v Bristol the other night I pretty much followed everything. 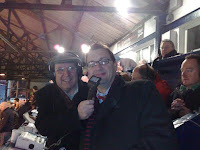 It helped that we were sitting near to legendary commentator John Gwynne (pictured) who has the most incredible voice. He didn't know who scored the second and fourth tries either. But we all knew who got the third one - Nick McLeod (sponsored by Insider). If you're wondering John who? Then there's more about him, here and here.